The IU South Bend Alumni Scholarship program is a remarkable success. The program was unique in the IU system upon its inception, thanks to its alumni leader driven focus by former Scholarship Committee Chairs Larry Lentych, Bruce Burkhart, and Mike Wargo. In 1996, Lentych, serving as the board’s vice-president, encouraged the board to play a larger role in the recruitment and retention of quality students from our community. Wargo recalls that the board wanted to resolve the following question: “How do we get students to come here, and stay here, and go on and graduate from IU South Bend, and then hopefully stay here in the community long-term?” The answer? Scholarships. 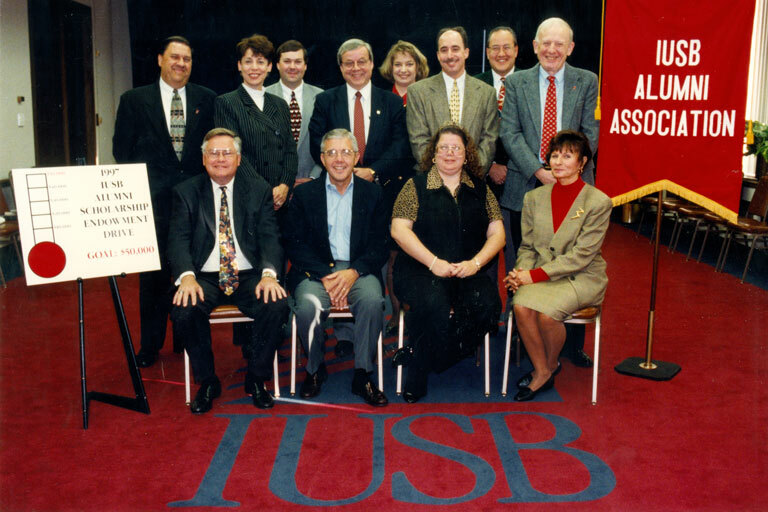 With an initial gift of $5,000, the first alumni scholarship program account established was the IUSB Alumni Association Scholarship Endowment Fund, intended to provide the area’s best and brightest students with full-ride scholarships to IU South Bend. Twenty years later, the Alumni Scholarship Program has expanded to 11 accounts and offers academic, social identity, and athletic scholarships to deserving students. More than 300 students have received support through the program. Gifts to and inspired by the program now total more than $1 million dollars. Lentych, who was the Chief Financial Officer at 1st Source Bank at the time, recruited Bruce Burkart, a vice president at the bank, to the board. Thanks to Burkhart’s relationships within the local business community, he was able to bring additional support to the program, and served as chair of the Scholarship Committee in its second year. During his tenure, he created teams and named team captains who reported on their progress. Wargo, who was board president at the time to Alumni Scholarship Program was started, served as the committee chair in the program’s third year. Over the years, the scholarship committee has had many fantastic leaders and committee members; however, one thing remains consistent—the IU South Bend Alumni Association board is committed to the Alumni Scholarship Program and its success. He fondly remembers one particular solicitation in support of the program. In 1998, the scholarship committee mailed out a “Blue Book” donation form, mimicking the traditional essay template used for university exams. In response to that mailing, an alumnus from outside the region made a $25,000 gift to the scholarship program. This was the largest gift to the program and significantly helped jumpstart the endowment. Burkhart credits the success of the program to the people they worked with, saying “good people do good things.” He recognizes the team captains and committee members who went out and talked about the program and the people, both individuals and business executives, who saw its value and supported the campaign at all levels. Meals shared between current program donors and recipients continue today on campus. Donors meeting the student scholarship recipients and seeing first-hand the impact their gift is having is very meaningful. It’s also a wonderful opportunity for students to share their gratitude and recognize the importance of philanthropy in a community. Thank you Larry, Mike, Bruce and all those who worked to establish and maintain the Alumni Scholarship Program. The IU South Bend Alumni Association is dedication to continuing this legacy of support for IU South Bend students. Written by Mallory Jagodzinski, Ph.D., associate director of Alumni Relations at Indiana University South Bend. If you would like to make a gift to the IU South Bend Alumni Association Scholarship Program, please contact Moira A. Dyczko are mdyczko@iusb.edu or 574.520.4383.